The rDrive 6114VM 4-Bay USB 3.1 RAID Array from HighPoint lets you quickly add a RAID storage solution to a Mac system by coming armed with four preformatted drives that provide a total capacity of 16TB. The rDrive 6114VM is equipped with a USB 3.1 Type-C port, transferring data at 10 Gb/s speeds, as well as four drive bays that each contain a 4TB 3.5" hard drive. The drives come preconfigured in a RAID 5 array, which delivers up to 400 MB/s reads and 220 MB/s writes. With rDrive Manager software suite, you can reconfigure the drives in a different RAID array, including multi-array configurations. To cool and power the drives, an 80mm cooling fan and 250W internal power supply are on board. Included along with the rDrive 6114VM is a USB Type-C to USB Type-A cable, so you can connect this storage unit to virtually any Mac system. An optional cable is required for Mac systems featuring only Thunderbolt 3 or USB Type-C ports. HighPoint's RAID Technology enables rDrive 6114VM RAID Solutions to host and manage a RAID 5 array across four hard drives, providing performance exceeding 400 MB/s. Advanced options allow the rDrive 6114VM to configure and host up to 4 separate RAID arrays, each assigned to a different task or project. 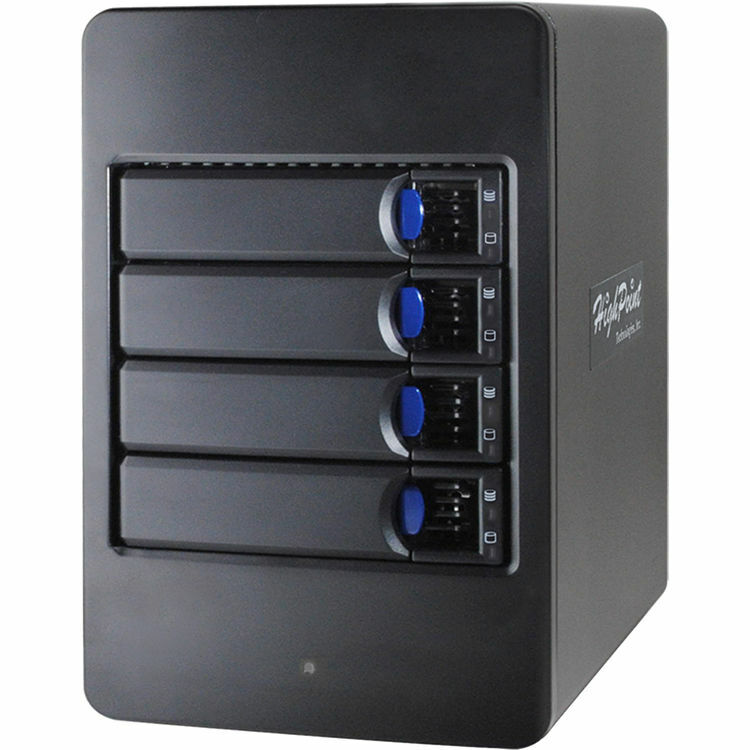 This multi-array capability is suitable for RAID 1 or mirroring configurations, and Mac OS backup applications such as Time Machine. Each retail kit includes all necessary chassis hardware, cabling, storage, and software. The compact 4-Bay drive enclosure ships preloaded with 4 hard drives configured as a RAID 5 array and can be easily attached to a Mac platform with a standard USB Type-A, convenient USB Type-C, or fast Thunderbolt 3 port. rDrive Manager's user-friendly, web-based management interface allows novices and experts alike, to quickly and easily monitor, maintain, and troubleshoot your RAID arrays from a single, unified software suite. Advanced management features allow customers to configure different RAID levels, including multi-array configurations. SHI (Storage Health Inspector) features integrated SMART support, which allows experienced users to monitor the physical health of each individual hard drive via real-time updates, and archive past activity using the event log. Users can also schedule maintenance sessions to verify disk integrity and enable Email notification to inform one or more users of changing storage conditions while outside of the work environment. Box Dimensions (LxWxH) 12.3 x 12.2 x 8.8"